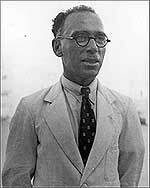 Is-Sur Fred Gauci, founder of Neptunes in 1929. Neptunes’ glorious history all but started in 1929 when a certain Alfred Gauci, then popularly known as Is-sur Fred, formed a strong waterpolo team from the many youngsters who used to meet and swim regularly at Balluta Bay. A wooden hut was erected and this served as the club house. On Gauci’s suggestion the club was to be called Neptunes as Neptune (Neptunus) was the god of the Sea. The game of waterpolo had already been in existence in Malta when Neptunes were formed. In fact the Amateur Swimming Association was founded in 1925. Peppu Farrugia, another stalwart in the club’s administration in those early years. Issur Peppu was the club’s first secretary and continued up to 1945 when Loris Manché was elected in his place. Our first competitive game was in 1931, in the second division against Vittoriosa at the Sliema Pitch. This used to be laid out on one side of the Chalet. Prior to this, however, Neptunes were making a name for themselves with the positive results they were obtaining when playing against teams from visiting warships. These included HMS Walrus, HMS Sussex, HMS Viscount and HMS Codrington. Teams from the British Fleet were being freely challenged and Neptunes had suddenly become the envy of all other previously established clubs. In 1944 Neptunes held several encounters against Services teams among which the most conspicuous was one nicknamed il-Palestinjani who had a really strong team. 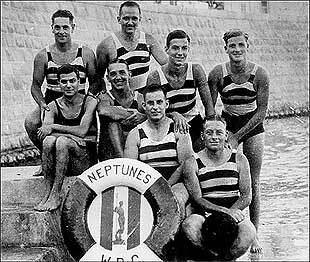 The members of Neptunes’ first side, way back in 1929, were Joe Demarco, John Chetcuti, Frank Bardon, Franz Mattei, Gerry Degiorgio, Jerry Calleja Gera and Joe Albanese. Franz Wismayer, Jimmy Chetcuti and the Podestà brothers, Wilfred and Arthur, the latter known as Babsie, gradually made the grade and were drafted in to support the squad. 1932 – Neptunes’ first ‘official’ triumph was winning the Division Two championship. This was the squad: Lt. Melville, a Royal Navy officer and shooting instructor at Ricasoli (coach), Anthony Degiorgio, Wilfred Podestà, Joe Albanese, is-sur Fred, the founder of the club; (front row) Franz Wismayer, Joe Demarco, John Chetcuti. (centre) Jimmy Chetcuti. In 1933 Neptunes, who in previous years were being denied participation among the ‘elite’, this time found themselves playing in the top sphere as all clubs were grouped in one division. Matches were played alternately at the Neptunes and St Julian’s pitches. Neptunes and Sliema finished on equal points. Without any previous notice, the association decreed that a ‘decider’ was to be played that same day which was a stormy October Sunday afternoon. The Neptunes players were taken by surprise but still faced the strong Sliema team and beat them. This was Neptunes’ first game against Sliema United and their first ever success. They continued on this vein by winning the knock-out competition as well and so Neptunes confirmed their true force which broke Sliema’s long-standing monopoly. Here started the bitter sporting rivalry between Sliema and Neptunes which exists till this very day. Suddenly the club was mobbed by youngsters who wanted to form part of the team. The Neptunes tree flourished with players by the name of Eggie Xuereb (whose son Martin was our goalkeeper in early seventies), Joe (Dormi) and Teddy Gatt (Teddy’s son Edward also had a say in the club’s successes), Marcel Bianchi, Alfred Lanzon (grandfather of Niki and Kayne), Wilfred Gatt, Alex Mizzi and others. 1933 – Standard formation of the Thirties: (back) Joe Albanese, Jimmy Chetcuti. (centre row) Joe Demarco, Wilfred Podestà, Babsie Podestà, Alfred Lanzon. (front row) Franz Wismayer, Anthony Degiorgio. It is interesting to note that the Maltese national waterpolo team that took part in the 1936 Olympic Games in Berlin included six players from the Neptunes’ side. These were Franz Wismayer, Jimmy Chetcuti, Joe Albanese, Wilfred and Babsie Podestà and Alfred Lanzon. Efforts to stage the 1936 championship officially on the national team’s return from Berlin proved futile, as other clubs did not relish facing Neptunes with the aforementioned Olympians in their side. In the Thirties, Neptunes won the league championship on the four occasions they took part in. That was in 1933, 1934, 1937 and 1938. They also won the first championship organised after the war in 1945. So one can freely claim that Neptunes won five consecutive first division league titles! Neptunes failed to take part in the ASA league in 1935 and 1939 for various reasons. In 1935 Neptunes took exception to remarks passed by a referee that Neptunes would never win the league championship again until he was in charge. The club withdrew from all competitions as a protest. 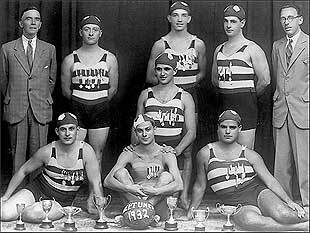 Then in 1939 the war tension seemed to have affected the waterpolo circles and in keeping with the uneasy atmosphere Neptunes withdrew from the competitions after a squabble over the alleged transfer of Walter Naudi to Sliema, with our club claiming that Walter was still a Neptunes player. War broke out in September 1939 and official competitions resumed in 1945. After winning the 1945 and 1949 leagues and the 1947 and 1949 KO competitions, Neptunes were to face a ten-year barren spell as we could find no youngsters who could replace the ageing veteran stars.